This is a 21 inch high, life size mask of high fired bisque. Hand painted bronze patina. Signed and dated by artist Robert R. Toth for its collectable value. "Dare to be honest and fear no labor ." The mask is also available in a limited edition of 45 foundry cast bronze. Prices on request from the artist Robert R. Toth. 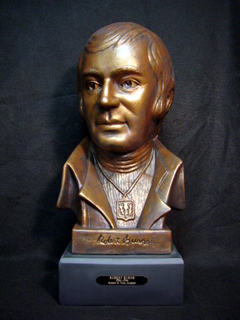 A small bust of Burns is also available. Long considered the national poet of Scotland, Robert Burns is the author of "Auld Lang Syne," "To a Mouse" and "Tam o'Shanter." 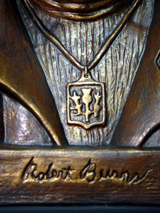 Raised in a poor family of farmers, Burns was nonetheless educated in literature and began writing verse when he was a teenager. His father died in 1784 and Burns tried to make a go of it as a farmer, but found more success with poetry. Despite his early death at the age of 37 (he had an unhealthy heart, it seems), Burns produced a large body of work, including the popular Scot anthem "Scots Wha Hae" and the poem "A Red, Red Rose." His life of carousing and his stick-it-to-the-man attitude further endeared him to his countrymen, and "Rabbie" Burns is still considered Scotland's best-loved poet.